Dental implants may seem like a complicated process at first. You don’t know what materials your dentist uses to recreate your teeth. You also aren’t familiar with the parts that make up dental implants. When your dentist has tried explaining them to you in the past you just nod your head in agreement, afraid to ask for a clarification. Now, you can walk into your dental implant consultation with confidence, knowing the buzzwords of dental implants. Plus, you’ll get to have a conversation with your dentist instead of sitting there with a puzzled look. What are the Parts of the Dental Implant? When thinking about dental implants, you must realize that the implant is essentially a prosthetic for your tooth roots. When your tooth falls out, blood flow ceases to travel to that area of the mouth. When a fixture is planted into your gums, it allows blood flow to start again and stimulate your mouth. When you refer to dental implant in conversation, you are talking specifically about the metal post or fixture that sits inside your jaw. Placing this part is the most important part of the procedure and will be mentioned often during your consultation. The other parts include the abutment and the porcelain crown. You may already be familiar with the crown, as it’s commonly used to protect broken or severely decayed teeth. The abutment however, is basically a screw that connects your implant and crown together and effectively keeps the crown in place. How Do Dental Implants Stay In? 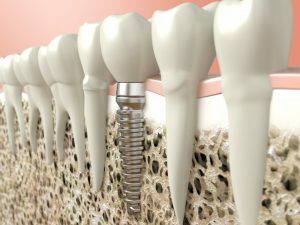 When your implant is placed, it undergoes a process known as osseointegration. Osseo refers specifically to the bone. After your implant is placed and your temporary crown is placed on top, the area will start healing and the implant will begin integrating with the bone in your jaw. Osseointegration allows the implant to fuse and improve the strength of your existing bone. It will also fit your teeth stronger than your natural teeth because it lacks the periodontal ligament natural teeth carry. What Materials Will My Dentist Use? Your dental implant components will consist of two main materials: porcelain and either titanium or zirconia. Like most dental restorations, porcelain is used because it interacts well with the body and holds the closest characteristics to natural teeth. It’s also easy to shape so it can properly fit on top of your implant. Your implant and abutment will most likely be made of titanium because of its biocompatibility and durability. The reason why dental implants are designed to last so long is because of the strength of the materials your dentist uses. If you happen to be allergic to titanium, as some people are, your dentist will use zirconia as a substitute. It has no prosthetic connections, meaning it will have a lower chance of growing bacteria. It’s also white in color, so it will blend in with your crown and surrounding teeth better. Still have questions about dental implants? Schedule a consultation with your dentist in Temple to learn more and see if dental implants are right for you! Dr. Elmore attended the University of Oklahoma for her undergraduate work and eventually the University of Texas Health Sciences Center at San Antonio dental school for her dental degree. During her residency, she learned many advanced dental procedures, including the proper placement of dental implants. To learn more about her practice, contact her at (254) 778-3900 or visit her website.